Many guitarists fall into the trap of only building their rhythm playing partially, while some of them might be fluent lead guitarists. Especially in blues music this holds true. This comes from the false believe that there isn’t a lot of variation possible in the blues. In this article I will prove this believe to be untrue while challanging your awareness of what is possible when playing blues rhyhtm parts. Let me showcase the deep world that blues rhythm guitar playing is all about. 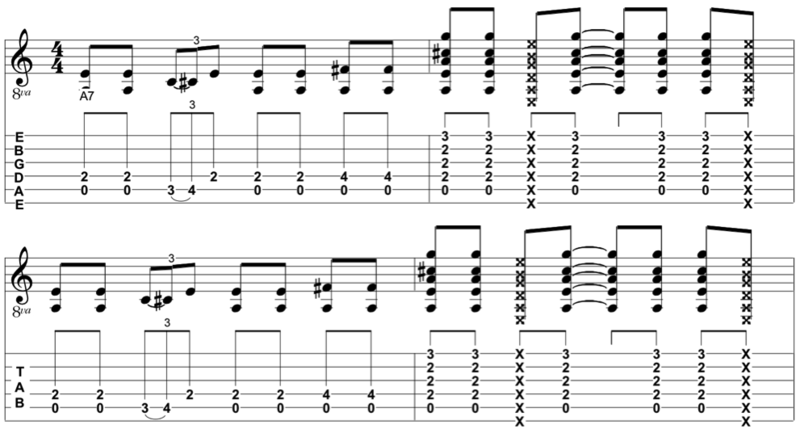 We’ll start of with a regular 12 bar blues riff. When students of the guitar engage in guitar lessons for the first time this is one of the first things they learn. Easy riffs such as the one below are one of the reasons why people wrongly assume that blues rhythm guitar playing is easy. I strongly agree with the fact that this is a very basic way of blues rhythm playing and we want to move away from this kind of playing early on. To be honest, it is quite boring to play this kind of ‘basic blues riffs’. While it is true that riffs such as this one are the basic foundation of many other blues shuffle riffs, you want to delve into more types of playing in order to not get stuck in this phase of your development on the guitar. So let’s look at how we can advance our basic riff and make it sound more dynamic. The riff above features the same rhythm as previously, but we’ve added a small change in each measure. On beat four we’ve added a triplet rhythm with a hammer-on. Doing this gives the whole riff a forward moving feeling and makes the whole much more enjoyable to listen to (and play). Next, we’ll make use of chords while we play this riff. I realize that this method of playing chords and riffs is just scratching the surface of what’s possible, that’s why you can download an entire ebook for free on the topic of playing advanced blues rhythm riffs. Here we’ve inserted blues chords in the original riff. To accomplish this we can use any dominant seventh chord. Now things are really starting to sound exciting! Take a listen to such rhythm riffs. Here I am playing a full 12 bar using this method of switching between chords and riffs: Listen to This Blues Riff. In the next example we are playing the same 12 bar, but now we start in a position higher upon the neck of the guitar. Don’t be afraid to play with an aggressive feel, your strings can take it! Here is an example of a 12 bar riff using this method where we are using the pentatonic scale to create dynamic blues riffs: Listen to This Blues Riff. In this way you would tap your foot to quarter notes, which makes it easier to grasp the rhythm of the riff. Once you get a hold of this, just double the tempo again. I agree that this might be hard at first. That’s why I wrote an article on the topic of how to play professional sounding blues rhythm riffs. Check it out if you need additional assistance with riffs like these. You often hear people talk about how rock originally was born out of blues, but it isn’t until you start learning about the connection between those styles that you are able to experience this for yourself. Take a look at the next riff. In the first measure we play our original blues riff, but in the second measure we are playing a straight on rock riff. I realize that this article is just scratching the surface of what’s possible, that’s why I created an eBook that you can download for free on the topic of playing advanced blues rhythm riffs. One last word of advice I want to give you; don’t ignore the fact that you are learning to play MUSIC. So it’s crucial that you listen to blues records and (learn to) jam along to them in order to develop your ear for the style we are playing. I have seen far to many people saying they wanted to learn to play the blues, without them actually listening to blues records. I can’t stress this point enough, as this will harm your progress in so many ways if you aren’t doing this.